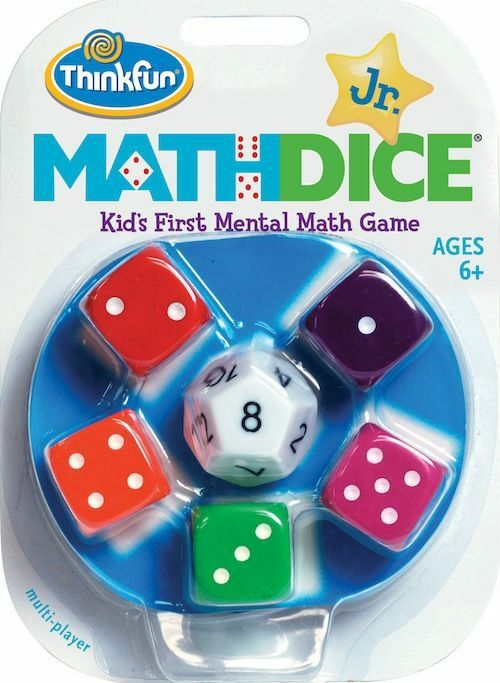 Math Dice Jr. is a game by Sam Ritchie, published by ThinkFun. It is for 2 or more players. In this game, players will be rolling dice, adding and subtracting, as they race to be the first to cross the finish line. The player that can do this first, will be declared the winner. To begin, the scoring track is placed in the middle of the play area. Players choose a game token, which they will then place at the starting line of the scoring track. They will also decide whether to play a short or long game, noting the finish line for each on the scoring track. The Target and Scoring dice are handed to the youngest player. Play now begins. Each round, players will take turns rolling the Target and Scoring dice, starting with the youngest player. The player will start by rolling the 12 sided Target die. The number rolled is the Target number that the players will be trying to reach. The player will then take the five 6 sided dice and roll each of them. There are the Scoring numbers that will be used to create the Target number through addition and/or subtraction. Players are allowed to use as many or as few numbers as they’d like. However each number on a die, may only be used once. Players are also allowed to use a single die number if it exactly matches the Target number. 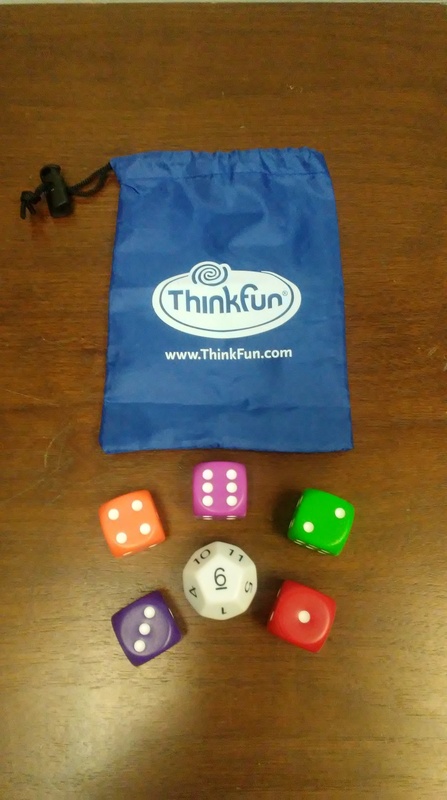 Once a player figures out how to add and/or subtract the numbers on the Scoring dice to be able to hit the Target number, they will then call out, “Math Dice”. They will then have to explain which numbers that they used and how they reached the Target number, keeping the dice that they used until the end of the round. Play will then continue, allowing other players to take a look at the remaining Scoring dice and try to create another way to hit the Target number. If they can figure out another way, they will also call out, “Math Dice”, repeating the process of explaining their numbers and holding on to any used dice. Once there are no more Scoring dice remaining, or there are no more ways to reach the Target number, the round ends. Each player will then score 1 point for each die that they collected that round. They will then move their scoring token ahead 1 space for each point earned. The player that last rolled the dice will then pass them to the next player in turn order and a new round will then begin. The game continues until a player reaches the finish line on the scoring track. Whoever does that first is the winner. This game comes with some really nice looking pieces. First off there are the large over sized dice. There is a large white 12 sided Target die and then 5 large brightly colored 6 sided Scoring dice. The Target die has numbers engraved in it, while the Scoring dice have pips like regular dice do. The game also comes with a screen printed and stitched neoprene board that folds up nice and neatly to fit perfectly inside the neoprene drawstring bag. 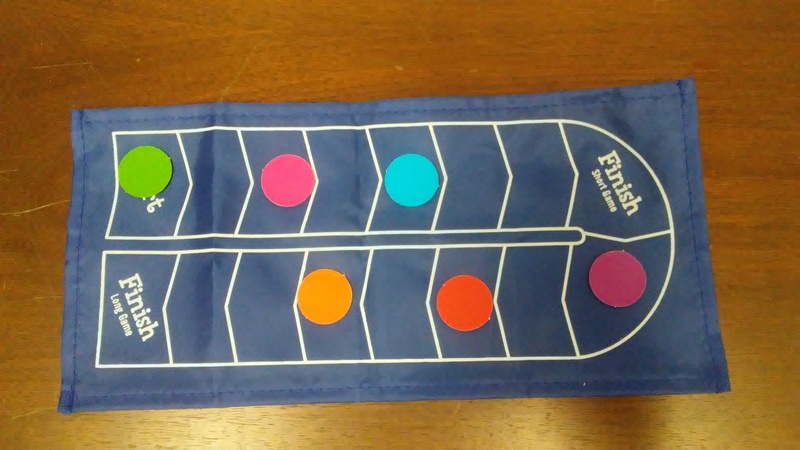 The bag is about 6 inches long and 5 inches across and it holds the large dice and board easily inside it. It also has a nice plastic spring clasp drawstring cord lock to keep everything inside the bag from falling out. I have to say that both the bag and the board are pretty darn cool. There’s also a rulebook included, which I will discuss in the next section. Finally there are some little colored cardboard scoring markers that must be punched out from the sole piece of colored cardboard inside the blister pack. Like it’s big brother, I think this one great too. I might even go so far as to say it’s even better looking than the original game. The bag is a little bigger so while you can’t exactly fit this one inside your pocket, it can still be carried pretty easily. Overall I really like the look and feel of the different pieces to this one. It’s really cool. The rulebook for this game is rather small, much like the rulebook for the original game. It also fits easily inside the drawstring bag that is included with this one. It has a lot less pages than the original game does, however everything is still in black and white just like before. There are a few more pictures in this rulebook, but about the same amout of examples of play. The rules for this game are even more simple than the ones for the original Math Dice. The rulebook includes a few variants to the rules so that you can play cooperatively or can use multiplication as well as addition and subtraction, for a bit more of a challenge. The book also includes a page of practice tables to help players see a few different ways of coming up with combinations of numbers to hit the Target number with. Most players won’t need this as the game and rules are quite simple. However it’s nice that it was added in the rulebook to help some of the younger players see as well as understand how to play. I think everything is explained really well and the rules won’t take but a minute or two to read over. I think this book gets the job done about as well as the original game. Let me go ahead and spoil the surprise on this game. I like it a lot more than the original. To me, the original while it was good and helps kids learn math in a fun way, it feels more educational than anything. The Jr version actually has a board and scoring pieces, so it feels more like an actual game to me. The math is simple enough that even my youngest can figure out the answers fairly easily. Like it’s big brother, it only takes about 10 minutes to play so it’s pretty darn quick. The components fit nicely inside the bag so that it can be taken pretty much anywhere and played anywhere. This one is actually quite fun as you race around the board scoring a point for every die that you used to hit the target number with. You’ll be sitting there trying to work out how to use 3 or 4 numbers and someone will grab 2 of them for a quick answer leaving your mouth wide open in shock. As my daughter and I would play, she would grab 2 numbers quickly while I’m trying to score 3 or more points. Guess I should have been a little quicker on the draw. I like how the game is educational but is still fun. It really helps the little ones with improving their addition and subtraction skills and can even be used with multiplication. Elementary school teachers and home school parents will find this game as a great resource. When those math lessons are getting boring, you can simply break out the dice and throw down the board and play a quick game. It’ll help you see where the kids need to spend more time at with their math. Everyone uses addition and subtraction so this is a game that the whole family can play. To me it makes the original game of Math Dice more like a board game. I highly recommend this one, even more than the original version. It’s great for teachers and home schoolers alike. Math Dice Jr. is an educational game of addition and subtraction to help sharpen and improve math skills for kids of all ages. It’s fast and simple. Most game sessions last around 10 minutes. It’s a fairly small game and can easily be carried in the drawstring bag that comes with it, making it playable almost anywhere. It upgrades with the kids math skills using the variant multiplication rules making it a great resource for elementary and home school teachers. This is one that the whole family can enjoy improving their math skills with. The addition of the board makes this one feel a bit more like an actual board game and increases the fun for me quite a bit. This is one that I would highly recommend, even above the original game. It’s definitely one that everyone with kids should own. You should definitely pick up one today. This entry was posted in Reviews and tagged board, board games, card, card games, dice, dice games, fun, games, jr, math, math dice jr, ritchie, sam, sam ritchie, think, thinkfun. Bookmark the permalink.